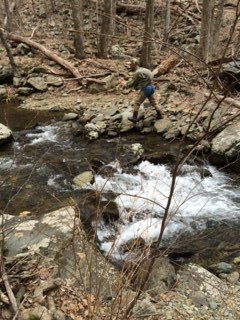 Spent 3 days fishing the mountain streams in the Shenandoah National Park with Tim Brookens. We did our research by attending the Lancaster Fly Fishing show and by visiting Murrays Fly Shop (www.murraysflyshop.com). Harry Murray, owner has written books on fishing the forest and was extremely helpful. We stayed at a cabin (Skyland) on Skyline Drive. Fishing the streams (locals call them rivers) requires hiking for a minimum of one hour and sometimes closer to two. Our 1st day was highly successful fishing the Rose River – landed 30 wild brookies. Day 2 was more challenging as it rained all night and then most of the day while fishing. We did tough it out on White Oak Run. Because it snowed during the night before day 3 and the temperature dropped to 17 degrees, we decided against a 2 hour hike to the Hughes River. 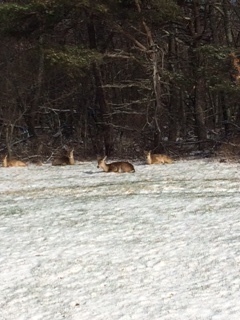 We opted to drive to the east side of Skyline Drive and fish the Rapidan River and a feeder stream called Staunton Run. The heavy rain and temperature drop caused the rivers to be swift and cold – only one fish! The pictures show the beauty of fishing these mountain streams….an adventure worth taking. Rose River is great! I’ve done a ton of hiking in Shenendoah National Park. I stop at the holes to watch the trout. It’s very cool that you got to fish there. I actually proposed to my wife, Karie, at the waterfalls of White Oak Canyon. Beautiful place. Did you see any bears? There are a lot of bears in the park. We needed you as a guide. We did not see any bear. What a beautiful and memorable place to propose. Let me know if you want to take up fly fishing. Craig and I would love to go with you.